Excel Hardware products have redefined the kitchen design systems in both quality and aesthetics. Their products are not only trendy and qualitative, they are designed to deliver utmost efficiency and convenience for their users. In this post, let’s take a look at their most innovative products! If you’re looking for simple and sweet design, then the Standalone shovel holder would be the perfect kitchen device for you. It is a small holder that can be used to hang small kitchen paraphernalia like spoons and ladles. It is minimal in design that features a unique uniformity while dangling the utensils. The circular base provides a stable design and an elegantly modular aesthetic. The anthropometry of this product is very definite. 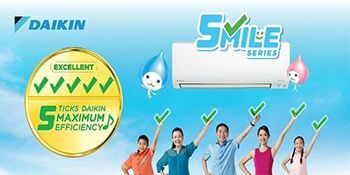 It’s a product that minimizes the day to day hassle and it maximizes efficiency as well. 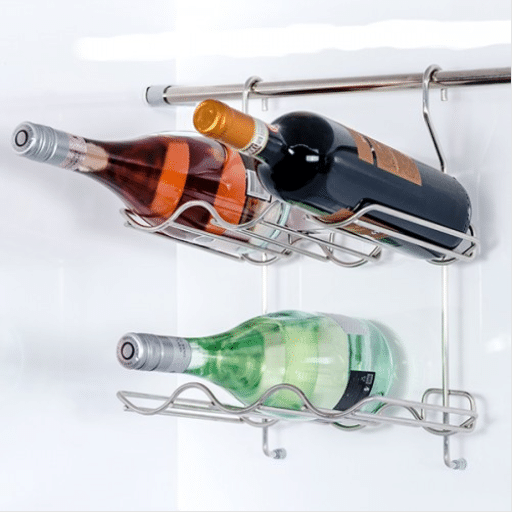 The wire racks with hanging rod DIY bracket is a charming wall mount hanging unit that you can use to feature your wine bottles, glasses and mugs in an aesthetically pleasing way. It’s stylish, elegant and minimalistic in style. It’s also designed in a completely ergonomic way – no bottle or glass can fall out of its wavy stainless-steel make. You’ll never have to worry about reaching out into the dark nooks and crannies of a cabinet for a glass or bottle again. The Italian cup holder series by Excel consists of 400mm long panels that you can safely tuck your drinking glasses and cups on. It’s a wall mount fixture that is made of an industrial grade steel. It features the utmost strength and durability, and the structure has been put through rigorous load testing to ensure optimum stability. It is a two-tiered product that enhances the efficiency of your day to day kitchen life by providing easy and convenient access to essentials. The wok pan cover lid holder is specifically crafted to make the process of cooking and storage easier. 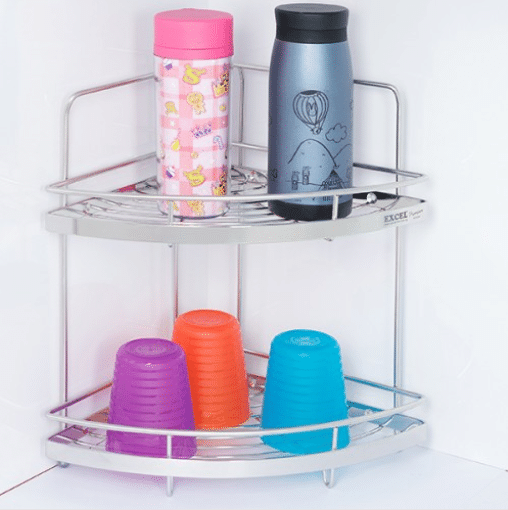 It consists of three tiers of different sizes that can hold a lid holder of any size. It’s a classical accessory that offers a nice aesthetic and pragmatic value to any kitchen space. It is made of stainless steel which is definitely durable enough to carry all the applied weight and more. 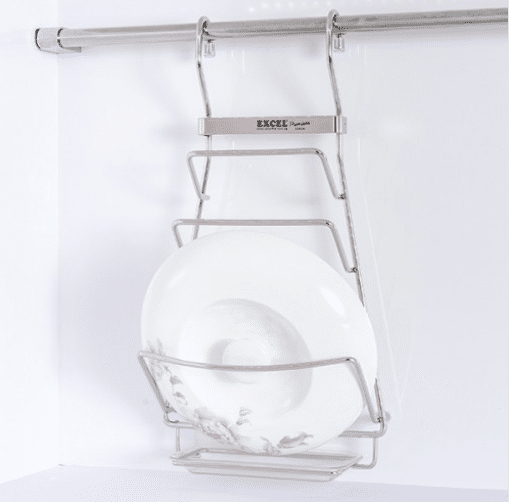 Its versatile shape makes sure that it can be easily hung in any part of your kitchen with ease. The 2-tier double rack sauce is one of those perpetually used kitchen accessories that can become an inherent part of the kitchen without much effort. It’s a versatile device that allows easy access to all the cooking paraphernalia that one needs on a regular basis. Its 470 mm in length that can easily hold a number of items. The first tier is simple and rectangular in shape which is perfect for holding on to boxed items and spices. On the other hand, the second tier is wavy that is perfect for holding sauce bottles. This rack has been made from durable stainless steel, and it can certainly hold all the weight you throw at it. Tissue paper has become an integral part of our daily lives – from toilets, kitchen and dining space to bedrooms, a full roll of tissue is always a must-have that makes our life easier. 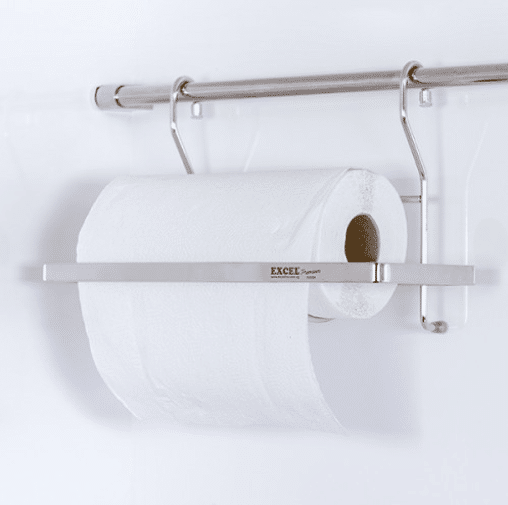 Hence, Excel 1 tier tissue paper roll scroll rack is a convenient accessory which can be used to store and present large quantities of tissue in an easy way. 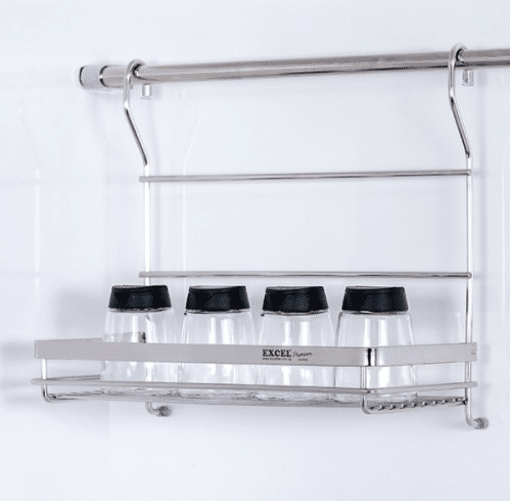 Needless to say, this rack features a simple and classic look along with a great functionality and durable stainless-steel physique. The DIY standalone arch fruit basket is a contemporary alternative to the regular old ceramic bowl. It’s a perfectly trendy way to keep your fruits in hands reach. 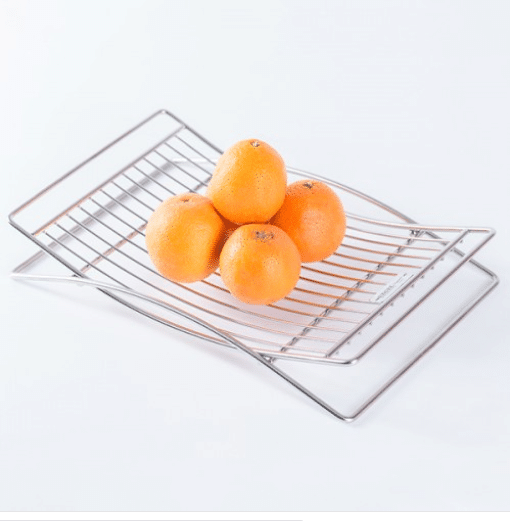 It consists of a stainless-steel basket that is arched in physique so that you can stack a number of fruits in the middle. The raised edges are protective guards so that nothing can fall out. Meanwhile, the materials used in this basket have been tested for consumables so there’s no chance of anything catching a toxic rust with age. 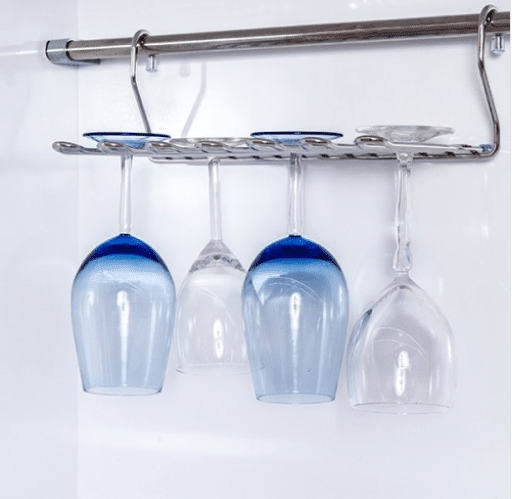 The hanging wine glass rack is an understated but aesthetically personified fixture of the commercial wine glass rack. 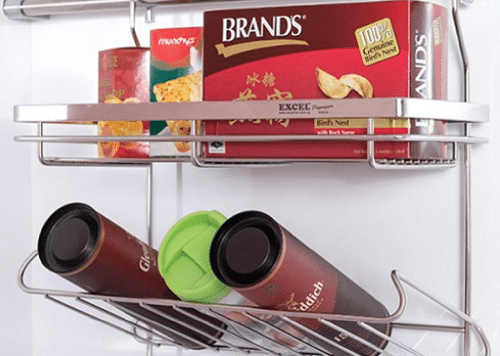 It has been designed specifically to fit in any regular sized HDB kitchen. It allows you to feature a small part of your wine glass collection. It’s made you to feature a small part of your wine glass collection. it'n. it wine glass rack. it of fruits in the middle. the phy of stainless steel that features a chrome plated luster that will never fade with age. It won’t get rust or corrode by constant exposure to water. This definitely offers a sophisticated style to the kitchen space. 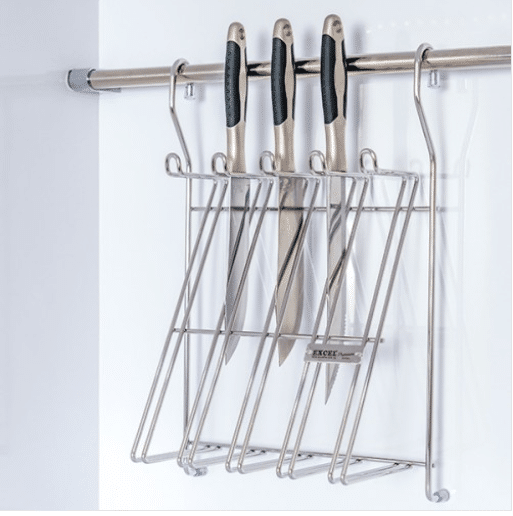 Knives are a ubiquitous kitchen utensil, here’s the Excel knife holder rack with hanging is a great solution for this conundrum. It consists of an industrial grade stainless steel formation with individual knife alcoves that can keep you safe and sound. 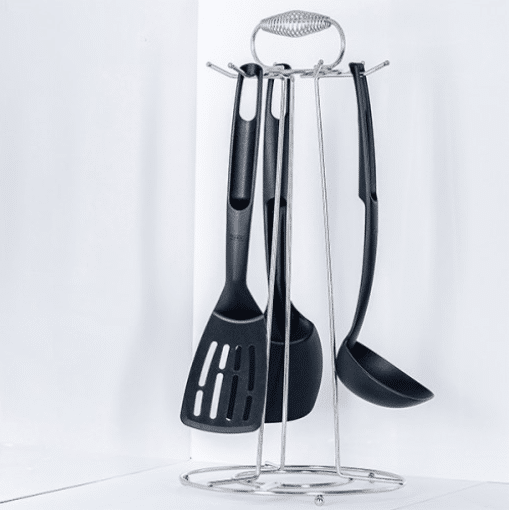 It is affordable, ergonomic and durable – perfect for regular kitchen use. Corner racks seem to be the new ‘clutter-away’ trend, and the 2-tier corner L-shaped corner rack is a completely versatile and ergonomic take on the conventional. It’s made of stainless steel which offers qualitative strength and durability. It won’t corrode or rust with age or exposure to water. Great thing is this is pretty affordable to stock away your stuff in an organized way. 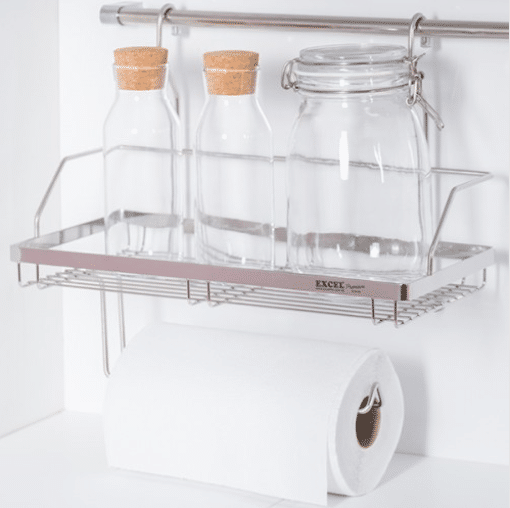 The 1 tier single rack with hanging rod DIY bracket has been specifically designed to hold brittle glass objects that can otherwise get broken up during the strenuous kitchen routine. It can be hung from a hanging rod that is easy to install. It’s pretty durable, and wide enough to put all of your glass bottles in a singular linear fashionable way. A D-shaped steel strip at both ends acts as a guard which provides adequate provisions for safe usage. 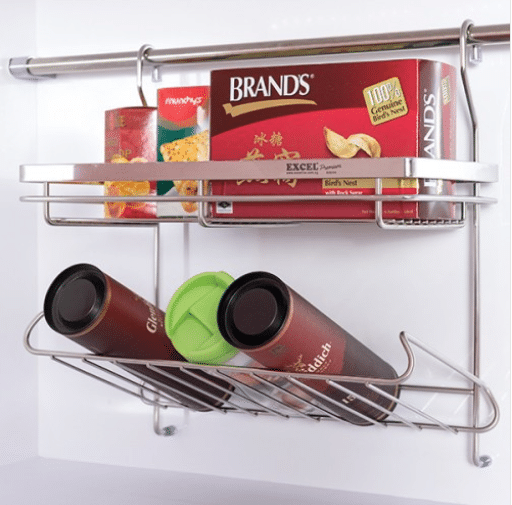 Ergonomics and aesthetics blend seamlessly in this two-tier spice cloth rack design. 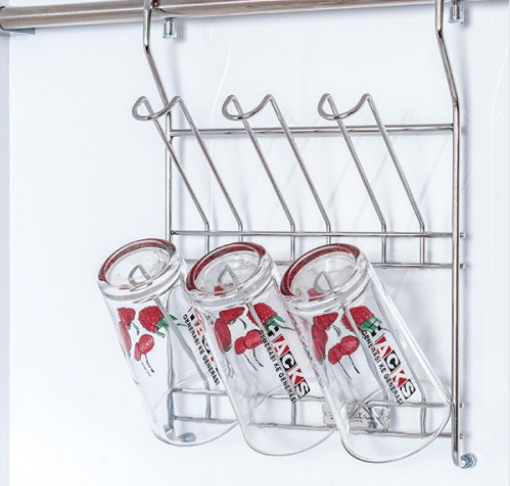 The first tier has been designed to hold various glass jars and other paraphernalia, while the second tier is designed to hold a single tissue rack. The material used in this rack is the industrial grade stainless steel which is truly durable. Furthermore, it has been put through rigorous load testing, so it can definitely hold its worth in weight. 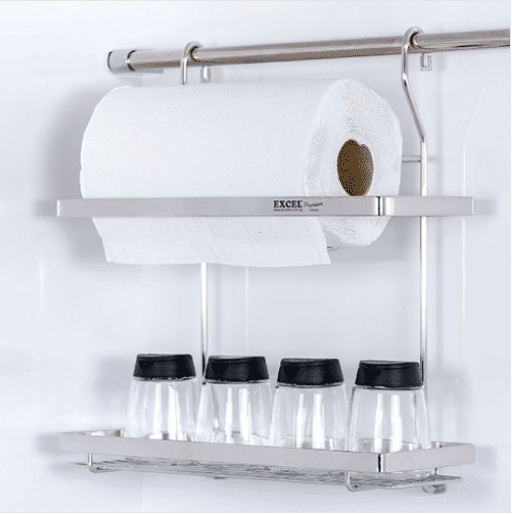 The 2-tier tissue paper roll scroll rack is one of those particularly user-friendly product designs that offers utmost productivity in relation to design and functionality. It consists of two tiers, each with its own individual function. The top tier is designed to hold a tissue paper roll, while the bottom tier is able to hold 3-4 glass bottles. It features a sturdy stainless-steel physique along with some sleek and modernist aesthetics. As you can see, each Excel products are definitely a study in ergonomics and they are truly user-friendly. Needless to say, Excel products are truly simple yet innovative in designs. If you have any kitchen-related shortcomings, let’s take a look at Excel products! You will be amazed and fall in love with Excel!